The furor in Europe over U.S. President Donald Trump’s travel ban on citizens from seven majority Muslim states has overshadowed what the London policy institute Chatham House calls a "reservoir of public support" on the continent for such measures, based on the findings of its latest poll. The survey of 10,000 people found that support for ending Muslim immigration averaged 55 percent across 10 European countries, ranging from 71 percent in Poland to 41 percent in Spain. African migrants help each other as they arrive at the CETI, the short-stay immigrant centre, after crossing the border from Morocco to Spain's North African enclave of Ceuta, Spain, Feb. 17, 2017. In Germany, just more than half supported curbs on Muslim immigration. More than 1.1 million asylum seekers entered Germany in 2015, about 40 percent from Syria, according to German authorities. Among them was Syrian national Bilal Al Nasir, who was 17 years old when he fled Damascus after his home was bombed. His face is scarred from the explosion; shrapnel is still embedded in his head. Speaking to VOA at his refugee shelter on the outskirts of Dresden in eastern Germany, Al Nasir said he he has seen a doctor and needs to undergo surgery for the wound in his head. While he waits for the operation, Al Nasir is receiving help in trying to find a job from a charitable network called KS24. Founder Ronny Frenzel says employment is vital if Germany is to successfully integrate the migrants. On the surface, Al Nasir’s new hometown of Dresden doesn’t appear to welcome such engagement. It is the birthplace of the PEGIDA movement, the Patriotic Europeans Against Islamization of the West. Every Monday supporters march through the city. The guest speaker this week was Renate Sandvoss of ‘Journalist Watch,’ which claims German media is covering up immigration problems. “'Muslim culture', and I say it in quote marks because to me it is not culture, is totally different than the German culture and simply does not fit in here,” she told VOA after the rally. 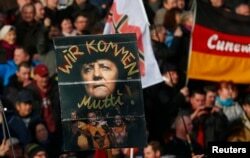 FILE - Supporters of the anti-Islam movement PEDIGA hold a poster depicting German Chancellor Angela Merkel with text reading "We are coming, mommy!" during a demonstration in Dresden, Germany, Feb. 6, 2016. When the PEGIDA movement was born more than two years ago in Dresden, the organizers hoped that it would spread across Germany and beyond to the rest of Europe. But that hasn’t materialized, and there’s a reason why, says Dresden University’s Professor Werner Patzelt. “To put it quite clearly, PEGIDA is more successful than it has ever been, only under a different label. Because AfD is PEGIDA. AfD is PEGIDA as a political party,” he said. AfD, Alternative for Germany, could become the third-largest party in elections scheduled for September. It has previously denied links with the PEGIDA movement, but Patzelt says it is one of several far right parties in Europe feeding off concerns over immigration. But the latest polls show support for the AfD party is falling. Global uncertainty will likely lead German voters to put economic stability ahead of immigration, analysts say, and Germany’s challenge will be to make the migrants part of that economic future.